Welcome to Myth #10 of our 16 blog-series highlighting women’s leadership myths. Myth # 10: We are a diverse organization. We already have a woman on our leadership team. In 1980, there were no female senior executives in the top 100 businesses in America. In 1994, there were no female CEOs of Fortune 500 companies. Since then, obviously, much has changed. In 2014, women held 19% of the board seats in S&P 500 companies. In 2015, 14% of the top five leadership positions in the Fortune 500 were held by women. This is, most certainly, progress. It can be tempting to view such advances for women in the work place with satisfaction and even complacency. The times are changing. We are diverse now. We’ve done enough. Women make up 51% of the population of the United States. They earn 47% of all law degrees, 48% of all medical degrees, and 44% of all master’s degrees in business and management. They are 47% of the U.S. labor force. But they only hold 14% of the top jobs. This is not diversity. This is inequity. And there is growing evidence to support that these numbers are not just inequitable. They do not even make good business sense. Gender diversity is not just equitable, it is profitable. According to a comprehensive global study of more than 21,000 firms from over 90 countries, the presence of female top executives is consistently associated with greater company performance and profitability. These correlations are not small. Data suggests that when profitable companies employed women in even 30% of leadership team positions, this corresponded with as much as a 15% increase in net revenue. This growth make sense. A leadership team should reflect the population it serves. A group with diverse backgrounds and experience leads to more thoughtful deliberations and decisions. The natural result of a gender diverse team is expanded reach to both male and female customers, clients, and consumers. True diversity grows the bottom line. Examine your organization. Are you guilty of the “lone woman” hire? 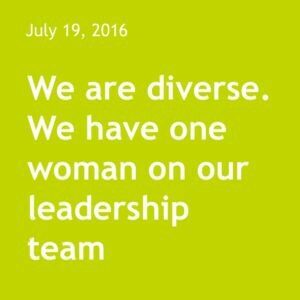 Do you point to the one female on your team to check the diversity box? Or do you have a pipeline? Is your organization a place where both men and women are mentored and groomed for future leadership opportunities? A truly diverse business reflects the population it serves. If 40-, 50-, or even 60-percent of your customers are women, consider mirroring those numbers in your leadership team. UPCOMING EVENT: September 15, 2016. Our second annual CIO Executive Council/Suffolk University Women’s Leadership Event: Declare your value. Sign up now for the early bird rate (ends July 31).